A small path to let the dogs out on this snowy winter’s day in Boston! 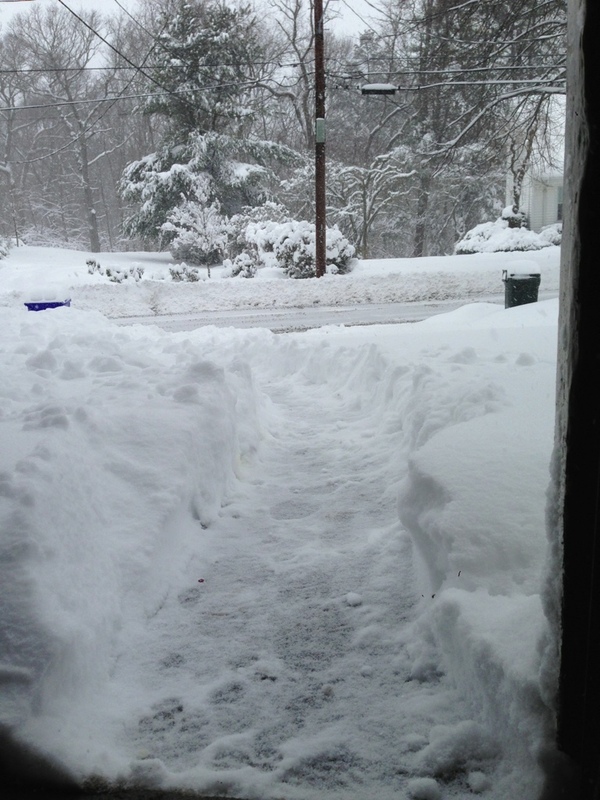 Hello George…this is a view of my driveway from the inside of my garage…I shoveled a narrow path so I wouldn’t have to carry them. Wow, you do nice work – and you got your work-out in today! Our children were probably passing each another in the concourses. Zach arrived this evening from IU for his break, snowing there too I think. I see your street is already plowed. If we had a big dump like that here, we wouldn’t see the asphalt for days, and would probably have to live off the old canned goods in the pantry that never get used for weeks! funny…we are new englanders…they have to be on top of things…Sorry about the Hawks tonight…. Ha…we have had so much snow in February and March, schools will be open until JULY!